Amazon RDS uses the Amazon Simple Notification Service (Amazon SNS) to provide notification when an Amazon RDS event occurs. These notifications can be in any notification form supported by Amazon SNS for an AWS Region, such as an email, a text message, or a call to an HTTP endpoint. Amazon RDS groups these events into categories that you can subscribe to so that you can be notified when an event in that category occurs. You can subscribe to an event category for a DB instance, DB snapshot, DB parameter group, or DB security group. For example, if you subscribe to the Backup category for a given DB instance, you are notified whenever a backup-related event occurs that affects the DB instance. If you subscribe to a configuration change category for a DB security group, you are notified when the DB security group is changed. You also receive notification when an event notification subscription changes. Event notifications are sent to the addresses that you provide when you create the subscription. You might want to create several different subscriptions, such as one subscription receiving all event notifications and another subscription that includes only critical events for your production DB instances. You can easily turn off notification without deleting a subscription by choosing No for Enabled in the Amazon RDS console or by setting the Enabled parameter to false using the AWS CLI or Amazon RDS API. Amazon RDS event notifications using SMS text messages are currently available for topic Amazon Resource Names (ARNs) and Amazon RDS resources in the US-East (Northern Virginia) Region. For more information on using text messages with SNS, see Sending and Receiving SMS Notifications Using Amazon SNS in the Amazon Simple Notification Service Developer Guide. Amazon RDS uses the ARN of an Amazon SNS topic to identify each subscription. The Amazon RDS console creates the ARN for you when you create the subscription. If you use the CLI or API, you create the ARN by using the Amazon SNS console or the Amazon SNS API when you create a subscription. Billing for Amazon RDS event notification is through the Amazon Simple Notification Service (Amazon SNS). Amazon SNS fees apply when using event notification. For more information on Amazon SNS billing, see Amazon Simple Notification Service Pricing. Create an Amazon RDS event notification subscription by using the Amazon RDS console, AWS CLI, or API. Amazon RDS sends an approval email or SMS message to the addresses you submitted with your subscription. To confirm your subscription, choose the link in the notification you were sent. When you have confirmed the subscription, the status of your subscription is updated in the Amazon RDS console's My Event Subscriptions section. You then begin to receive event notifications. When Amazon SNS sends a notification to a subscribed HTTP or HTTPS endpoint, the POST message sent to the endpoint has a message body that contains a JSON document. For more information, see Amazon SNS Message and JSON Formats in the Amazon Simple Notification Service Developer Guide. The following section lists all categories and events that you can be notified of. It also provides information about subscribing to and working with Amazon RDS event subscriptions. Amazon RDS generates a significant number of events in categories that you can subscribe to using the Amazon RDS Console, AWS CLI, or the API. Each category applies to a source type, which can be a DB instance, DB snapshot, DB security group, or DB parameter group. The following table shows the event category and a list of events when a DB instance is the source type. The DB instance is restarting due to a previous controlled shutdown, or a recovery. The DB instance will be unavailable until the restart completes. The DB instance is undergoing a controlled shutdown. An error has occurred while restarting MySQL or MariaDB. A backup of the DB instance has started. A backup of the DB instance is complete. The DB instance has been added to a security group. The DB instance is being converted to a Multi-AZ DB instance. The DB instance is being converted to a Single-AZ DB instance. The DB instance class for this DB instance is being changed. The current storage settings for this DB instance are being changed. A parameter group for this DB instance has changed. A parameter group for this DB instance has finished updating. Automatic backups for this DB instance have been disabled. Automatic backups for this DB instance have been enabled. There are [count] users that match the master user name. Users not tied to a specific host have been reset. The DB instance has been converted to a Multi-AZ DB instance. The DB instance has been converted to a Single-AZ DB instance. The DB instance class for this DB instance has changed. The storage settings for this DB instance have changed. The DB instance has been removed from a security group. The master password for the DB instance has been reset. An attempt to reset the master password for the DB instance has failed. The Enhanced Monitoring configuration has been changed. A DB instance is being created. The DB instance has been deleted. Amazon RDS is not attempting a requested failover because a failover recently occurred on the DB instance. A Multi-AZ failover that resulted in the promotion of a standby instance has started. A Multi-AZ failover that resulted in the promotion of a standby instance is complete. It may take several minutes for the DNS to transfer to the new primary DB instance. The instance has recovered from a partial failover. failover RDS-EVENT-0049 A Multi-AZ failover has completed. A Multi-AZ activation has started after a successful instance recovery. A Multi-AZ activation is complete. Your database should be accessible now. The DB instance has failed due to an incompatible configuration or an underlying storage issue. Begin a point-in-time-restore for the DB instance. The DB instance is in an incompatible network. Some of the specified subnet IDs are invalid or do not exist. The DB instance has invalid parameters. For example, MySQL could not start because a memory-related parameter is set too high for this instance class, so the customer action would be to modify the memory parameter and reboot the DB instance. Error while creating Statspack user account PERFSTAT. Please drop the account before adding the Statspack option. Enhanced Monitoring cannot be enabled without the enhanced monitoring IAM role. For information on creating the enhanced monitoring IAM role, see To create an IAM role for Amazon RDS Enhanced Monitoring. Enhanced Monitoring was disabled due to an error making the configuration change. It is likely that the enhanced monitoring IAM role is configured incorrectly. For information on creating the enhanced monitoring IAM role, see To create an IAM role for Amazon RDS Enhanced Monitoring. The IAM role that you use to access your Amazon S3 bucket for SQL Server native backup and restore is configured incorrectly. For more information, see Setting Up for Native Backup and Restore. Aurora was unable to copy backup data from an Amazon S3 bucket. It is likely that the permissions for Aurora to access the Amazon S3 bucket are configured incorrectly. For more information, see Migrating Data from an External MySQL Database to an Amazon Aurora MySQL DB Cluster. The DB instance has consumed more than 90% of its allocated storage. You can monitor the storage space for a DB instance using the Free Storage Space metric. For more information, see Viewing DB Instance Metrics. The allocated storage for the DB instance has been exhausted. To resolve this issue, you should allocate additional storage for the DB instance. For more information, see the RDS FAQ. You can monitor the storage space for a DB instance using the Free Storage Space metric. For more information, see Viewing DB Instance Metrics. Offline maintenance of the DB instance is taking place. The DB instance is currently unavailable. Offline maintenance of the DB instance is complete. The DB instance is now available. notification RDS-EVENT-0044 Operator-issued notification. For more information, see the event message. notification RDS-EVENT-0047 Patching of the DB instance has completed. notification RDS-EVENT-0048 Patching of the DB instance has been delayed. notification RDS-EVENT-0054 The MySQL storage engine you are using is not InnoDB, which is the recommended MySQL storage engine for Amazon RDS. For information about MySQL storage engines, see Supported Storage Engines for MySQL on Amazon RDS. The number of tables you have for your DB instance exceeds the recommended best practices for Amazon RDS. Please reduce the number of tables on your DB instance. For information about recommended best practices, see Amazon RDS Basic Operational Guidelines. The number of databases you have for your DB instance exceeds the recommended best practices for Amazon RDS. Please reduce the number of databases on your DB instance. notification RDS-EVENT-0064 The TDE key has been rotated. For information about recommended best practices, see Amazon RDS Basic Operational Guidelines. You attempted to convert a DB instance to Multi-AZ, but it contains in-memory file groups that are not supported for Multi-AZ. For more information, see Multi-AZ Deployments for Microsoft SQL Server. The DB instance has been stopped. The DB instance has been started. The DB instance is being started due to it exceeding the maximum allowed time being stopped. The DB instance has a DB engine minor version upgrade available. read replica RDS-EVENT-0045 An error has occurred in the read replication process. For more information, see the event message. For information on troubleshooting Read Replica errors, see Troubleshooting a MySQL Read Replica Problem. read replica RDS-EVENT-0046 The Read Replica has resumed replication. This message appears when you first create a Read Replica, or as a monitoring message confirming that replication is functioning properly. If this message follows an RDS-EVENT-0045 notification, then replication has resumed following an error or after replication was stopped. Replication on the Read Replica was terminated. Replication on the Read Replica was manually stopped. Replication on the Read Replica was reset. Recovery of the DB instance has started. Recovery time will vary with the amount of data to be recovered. Recovery of the DB instance is complete. A manual backup has been requested but Amazon RDS is currently in the process of creating a DB snapshot. Submit the request again after Amazon RDS has completed the DB snapshot. Recovery of the Multi-AZ instance has started. Recovery time will vary with the amount of data to be recovered. Recovery of the Multi-AZ instance is complete. The DB instance has been restored from a DB snapshot. The DB instance has been restored from a point-in-time backup. The following table shows the event category and a list of events when a DB parameter group is the source type. The parameter group was modified. The following table shows the event category and a list of events when a DB security group is the source type. The security group has been modified. The Amazon EC2 security group owned by [user] does not exist; authorization for the security group has been revoked. The following table shows the event category and a list of events when a DB snapshot is the source type. A manual DB snapshot is being created. A DB snapshot has been deleted. A manual DB snapshot has been created. A DB instance is being restored from a DB snapshot. Started the copy of the cross region DB snapshot [DB snapshot name] from source region [region name]. Finished the copy of the cross region DB snapshot [DB snapshot name] from source region [region name] in [time] minutes. The copy of a cross region DB snapshot failed. creation RDS-EVENT-0090 An automated DB snapshot is being created. creation RDS-EVENT-0091 An automated DB snapshot has been created. The following table shows the event category and a list of events when an Aurora DB cluster is the source type. A failover for the DB cluster has failed. A failover for the DB cluster has restarted. A failover for the DB cluster has finished. A failover for the DB cluster has begun within the same Availability Zone. A failover for the DB cluster has begun across Availability Zones. Migration to an Aurora DB cluster failed. An attempt to convert a table from the source database to InnoDB failed during the migration to an Aurora DB cluster. A scaling point was not found. The DB cluster stop failed. The DB cluster is being started due to it exceeding the maximum allowed time being stopped. The DB cluster has a DB engine minor version upgrade available. The following table shows the event category and a list of events when an Aurora DB cluster snapshot is the source type. Creation of a manual DB cluster snapshot has started. A manual DB cluster snapshot has been created. You can create an Amazon RDS event notification subscription so you can be notified when an event occurs for a given DB instance, DB snapshot, DB security group, or DB parameter group. The simplest way to create a subscription is with the RDS console. If you choose to create event notification subscriptions using the CLI or API, you must create an Amazon Simple Notification Service topic and subscribe to that topic with the Amazon SNS console or Amazon SNS API. You will also need to retain the Amazon Resource Name (ARN) of the topic because it is used when submitting CLI commands or API actions. For information on creating an SNS topic and subscribing to it, see Getting Started with Amazon SNS in the Amazon Simple Notification Service Developer Guide. You can specify the type of source you want to be notified of and the Amazon RDS source that triggers the event. These are defined by the SourceType (type of source) and the SourceIdentifier (the Amazon RDS source generating the event). If you specify both the SourceType and SourceIdentifier, such as SourceType = db-instance and SourceIdentifier = myDBInstance1, you receive all the DB instance events for the specified source. If you specify a SourceType but don't specify a SourceIdentifier, you receive notice of the events for that source type for all your Amazon RDS sources. If you don't specify either the SourceType or the SourceIdentifier, you are notified of events generated from all Amazon RDS sources belonging to your customer account. Event notifications might take up to five minutes to be delivered. In navigation pane, choose Event subscriptions. In the Event subscriptions pane, choose Create event subscription. For Name, enter a name for the event notification subscription. For Send notifications to, choose an existing Amazon SNS ARN for an Amazon SNS topic, or choose create topic to enter the name of a topic and a list of recipients. For Source type, choose a source type. Choose Yes to enable the subscription. If you want to create the subscription but to not have notifications sent yet, choose No. Depending on the source type you selected, choose the event categories and sources that you want to receive event notifications for. The Amazon RDS console indicates that the subscription is being created. You can list your current Amazon RDS event notification subscriptions. In the navigation pane, choose Event subscriptions. The Event subscriptions pane shows all your event notification subscriptions. To list your current Amazon RDS event notification subscriptions, use the AWS CLI describe-event-subscriptions command. The following example describes all event subscriptions. The following example describes the myfirsteventsubscription. 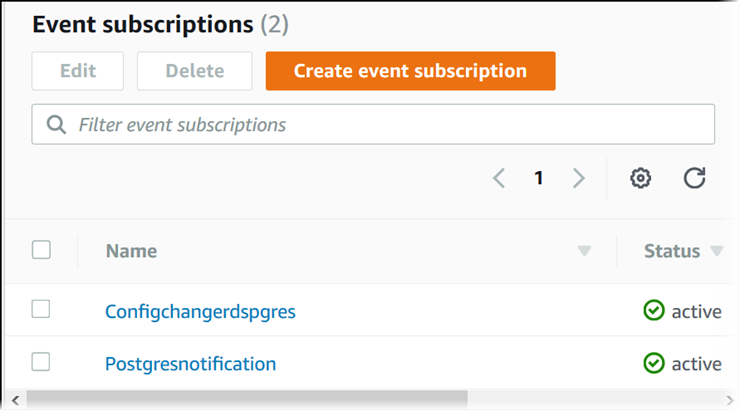 To list your current Amazon RDS event notification subscriptions, call the Amazon RDS API DescribeEventSubscriptions action. The following code example lists up to 100 event subscriptions. After you have created a subscription, you can change the subscription name, source identifier, categories, or topic ARN. In the navigation pane, choose Event subscriptions. In the Event subscriptions pane, choose the subscription that you want to modify and choose Edit. Make your changes to the subscription in either the Target or Source section. Choose Edit. The Amazon RDS console indicates that the subscription is being modified. The following code enables myeventsubscription. You can add a source identifier (the Amazon RDS source generating the event) to an existing subscription. You can easily add or remove source identifiers using the Amazon RDS console by selecting or deselecting them when modifying a subscription. For more information, see Modifying an Amazon RDS Event Notification Subscription. The following example adds the source identifier mysqldb to the myrdseventsubscription subscription. You can remove a source identifier (the Amazon RDS source generating the event) from a subscription if you no longer want to be notified of events for that source. The following example removes the source identifier mysqldb from the myrdseventsubscription subscription. All events for a resource type are grouped into categories. To view the list of categories available, use the following procedures. 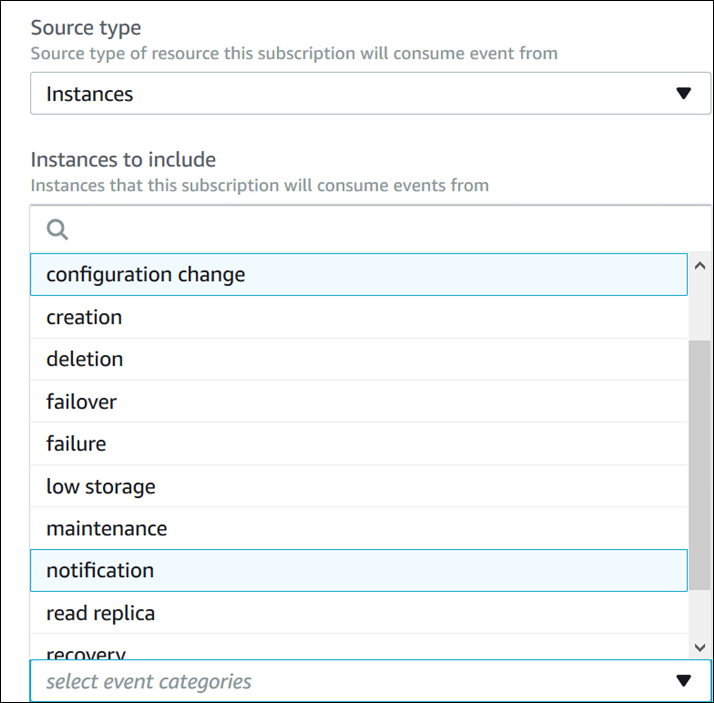 When you create or modify an event notification subscription, the event categories are displayed in the Amazon RDS console. For more information, see Modifying an Amazon RDS Event Notification Subscription. To list the Amazon RDS event notification categories, use the AWS CLI describe-event-categories command. This command has no required parameters. To list the Amazon RDS event notification categories, use the Amazon RDS API DescribeEventCategories command. This command has no required parameters. You can delete a subscription when you no longer need it. All subscribers to the topic will no longer receive event notifications specified by the subscription. In the navigation pane, choose DB Event Subscriptions. 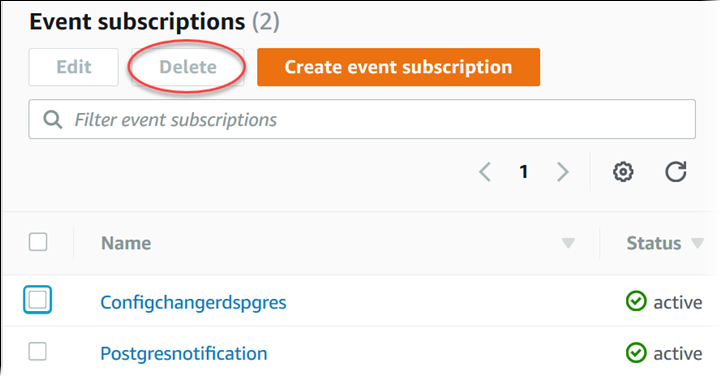 In the My DB Event Subscriptions pane, choose the subscription that you want to delete. The Amazon RDS console indicates that the subscription is being deleted. The following example deletes the subscription myrdssubscription.